Poet Jonathan Goh’s recent publication, “Eludoran: The Legend of Lorelei in a Geste of Grave Misconceptions” (published by Partridge Singapore) has earned the distinction of longest fantasy rhyming poem ever written in Singapore. Dedicated as a tribute to his late grandfather, “Eludoran” is a commentary of stereotypical fantasy fiction comprising three acts in 44 chapters. This numbering is not a coincidence; it is intended as a subtle reference of its subject matter since the number four in Chinese cultures is synonymous with death. Inspired by the works of earlier fantasy authors such as J.R.R. Tolkien and Brian Jacques, “Eludoran” offers its audience a darker perspective into the world of animal fantasy. Set in a medieval world populated by anthropomorphic animals, “Eludoran” follows Lorelei, a vixen princess, as she undertakes a quest hoping to win respect and affection from her father, Arulaine. A tragic flaw in her character will be the catalyst for her downward spiral into darkness. Arulaine and his nephew, Malachi, set out in search of Lorelei. Goh intersperses his book with Asian cultural references. He subtly includes parallels with Asian family dynamics and Chinese numerology. He believes that his book, though, will be entertaining for fantasy fans of any ethnicity. At more than 15,000 lines of verse, “Eludoran” became record breaking in Singapore for its length. The poem was officially recognized by the Singapore Book of Records. Jonathan Goh is a graduate of the University of Western Australia’s psychology program and an award-winning poet. 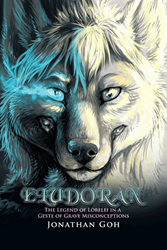 He is looking to make his novel “Eludoran” into both a film and graphic novel. Partridge Singapore is supported self-publishing imprint from Author Solutions LLC. Author Solutions is a stand-alone company within the Penguin Random House Group. Author Solutions operates independently and powers Partridge along with several other self-publishing imprints. For more information or to publish a book, visit partridgepublishing.com/singapore or call 800 101 2657 (Singapore) or 1 800 81 7340 (Malaysia). For the latest, follow @PartridgeSG on Twitter.